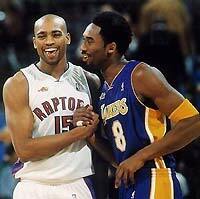 Toronto Raptors forward Vince Carter was added to the U.S. team Monday for next month's men's Olympic qualifying tournament, replacing Los Angeles Lakers' Kobe Bryant. Charged with sexually assaulting a 19-year-old woman at a Colorado spa, Bryant ruled himself out of the tournament scheduled for August 20-31 in San Juan, Puerto Rico because of recent shoulder and knee surgery. USA Basketball, however, said in a statement that Bryant would retain his place on the roster for the 2004 Olympic Games in Athens should the U.S. qualify. "USA Basketball's Senior National Team committee is very pleased to announce that Vince has accepted an invitation to play for the USA in this summer's FIBA Americas Olympic Qualifying Tournament," said Stu Jackson, chairman of the committee. "We are thrilled to have an exciting and versatile player like Vince back in a USA Basketball uniform." The acrobatic Carter starred for the U.S. at the Sydney Olympics, averaging 14.8 points per game to lead the team in scoring as the Americans won the gold medal. 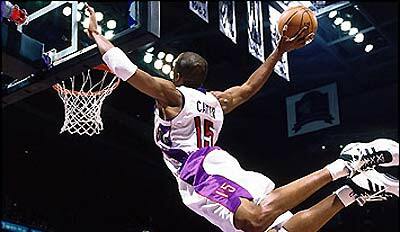 However, Carter, a four-time all-star and 1999 NBA Rookie of the Year, has struggled with injuries the past two years, appearing in just 43 games last season. Carter will join team mates Karl Malone, Ray Allen, Jason Kidd, Tim Duncan, Allen Iverson, Jermaine O'Neal, Tracy McGrady, Mike Bibby, Elton Brand, Richard Jefferson and Nick Collison for a nine-day training camp in New York from August 10 to 18 ahead of the qualifying tournament. Only the top three finishers in the 10-nation Americas qualifying tournament will earn places in the 2004 Games. Canada, Puerto Rico, Dominican Republic, Mexico, the U.S. Virgin Islands, Brazil, Argentina, Uruguay and Venezuela are the other countries taking part in the competition.